Did you know that the old Mannings High School building is the second oldest of it's type in Jamaica? But the singularity of Mannings school is much greater than the historic old building (now the library), it has a deep and interesting history and a very strong and proud heritage. A Mannings student depicts substance, style & intelligence :-) :-) ! 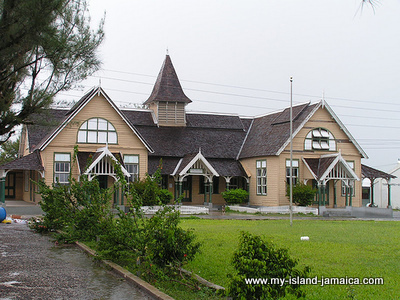 The illustrious history of Mannings, dates back to 1710, when Thomas Manning, a westmoreland proprietor, left thirteen slaves with land and the produce of a pen and cattle, to endow a free school for the parish. Twenty eight years later (in 1738)- the school was established. Note however that the school was established on the present site in Savanna-la-mar instead of on the lands left by Manning at Burnt Savannah Pen, at the northern end of the George's Plain. The JNHT provides a concise but interesting summary of the school here. I am honoured to say, 'I am a proud past student of Mannings!'. My tenure there was between 1989 and 1994, and although it was one of the most challenging period in my life, it is still one of the best. I have some great memories, thanks to all my classmates, including Denzil Williams, Floyd Grey, Nickeisha Whyte and indeed the entire classes of 1 grey, 2 grey, 3 yellow and the 4 & 5 crimson group. Today, like most other educational institutions in Jamaica, we have some challenges, but the school continues to shine educationally on it's fundamental philosophy that 'vita sine litteris mors est' (live without learning is death). For information related to admissions, costs, student transfer, areas of study, extra curricular activities and another general enquiries, contact the school using the contact information listed below. Note that the Facebook Page captures all the latest news and developments regarding the school. Be sure to check them out. And, God be praised, Thou hast not faltered yet. To love the trees the herb upon the hills. And for our sons to work for treasures new. That We Remember Thee, Our Own Dear Manning's School. Return to the Colleges in Jamaica from Mannings High School. Return to HomePage from the Mannings High School.